Chemistry is the incredible science of, well, stuff. Everything in the universe from distant galaxies to the air you're breathing is made up of the same basic types of stuff. These ingredients are known as atoms. We've learned a lot about their makeup, but chemists aren't as concerned with them as individuals as we are with what happens to them when they start to group up. Groups of atoms are called compounds or molecules. 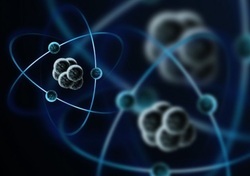 The atoms they are made of can stick together in different ways depending on their properties. Molecules even begin to interact with other molecules. This is where the study of chemistry really begins.